In this, the second of my reviews of World Sports magazine’s cricket writing, the first magazine which I would like to summarize appeared in June 1948. Sir Robert Bruce Lockhart waxed lyrical about a contemporary of his, one KG “Grunt” McLeod, who is described as Scotland’s finest ever all-round athlete. McLeod was asked to play rugby for Scotland against Wales at just 16, though his headmaster refused on his behalf, but he did feature against the All-Blacks the following year. A Cambridge Blue at athletics, he also played cricket for Lancashire and, in his most famous match, put the White Rose to the sword in 1911 with a swashbuckling century that saved the match. He also played football for Manchester City. After retiring to South Africa (he was gassed in the war and threatened with tuberculosis), he played golf off scratch. Our own Martin Chandler reviewed a biography of McLeod, Then Came a Cloud, which can be found here. Lockhart was himself a very interesting character, having been a footballer, writer and secret agent, in the latter capacity being teamed with Sidney Reilly, of Reilly, Ace of Spies fame, that miniseries being based on the original book Ace of Spies written by Lockhart’s son, Robin Bruce Lockhart. In the Scrapbook of Sport cartoon section of June 1948’s World Sports, there are two cricket items – first, the Six page bat, featuring the story of the cricket bat which Victor Trumper used to score a century against England in 1902, and which carries 400 autographs; the bat had to be split into sections to accommodate them all. Secondly, we learn that William Clarke, who opened the Trent Bridge cricket ground, was not selected for the annual Players vs Gentlemen fixture until he had been in the game for 30 years. There appears a commercial for The Ashes, a preview of the forthcoming visit of Bradman’s soon-to-be Invincibles, which was penned by Neville Cardus and available for the princely sum of one shilling (no doubt much more valuable now – perhaps the aforementioned Mr. Chandler can comment). In Cardus’ piece this month, he writes about the 50-year anniversary of Trent Bridge being awarded its first Test, describing the delights of walking on the grass and watching the cricket at the same time, such as when McCabe played his wonderful innings of 232, glorious with the sunset of lost causes. Also how it was still possible for small boys to watch their heroes in the nets, whereas at Old Trafford they were obliged to crane their necks through iron rails which separated the hoi-polloi from the practice ground – I remember getting my head stuck, apparently beyond withdrawal for ever, because I had prised it too far forward to look at Ranjitsinhji in the distance. Hard to picture Cardus as a young boy. He speaks of how author JM Barrie would attend Tests at Trent Bridge, but that wild horses wouldn’t have dragged him to Manchester. 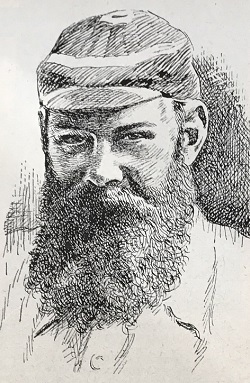 In that first Test at Trent Bridge, WG Grace had made his final appearance, scoring 28 and 1, taking 0 for 37 and fielding with difficulty and much excess of flesh. In the next Test played at Nottingham, in 1905, Archie Maclaren played one of the most majestic of all innings, scoring 140 and as captain had given BJT Bosanquet, at that time novel, uncharted and anathema, just long enough to find his length and subsequently go through the Australian innings with 8/107. Bradman scored his first Test match century in England there in 1930 while later in Australia’s second innings Stan McCabe was shaping up to win it for England – enter one Sydney Copley, England substitute, emerging from anonymity and into history…Copley’s catch will be spoken of at Trent Bridge as long as lovers of the game gather together with unfaded memories. Cardus loved the fast bowlers, and not just those of the highest quality – Until every county can boast again a Buckenham, a Field, a Skelding, a Howell, a Bestwick, a Warren, a Wass…until then, the game will remain weak in red corpuscles. Wass, a Trent Bridge favourite, was, unusually for a fast bowler, at his best on a spinner’s pitch. He wraps up with this plea: Let our cricketers play up and play the game. They’ll never be so young again. In the July 1948 edition, Cardus celebrates the birth of WG Grace exactly 100 years before. In a first-class career covering 46 years, the Grand Old Man amassed 54,896 runs in 1388 innings with an average of 39.55, as well as 2,864 wickets at 17.97 – and, as ACM Croome used to say “some of them must have been out.” Cardus goes on to note that it is profane to quote figures to celebrate the genius of the greatest player of them all – Just as all music-lovers cannot recall the time when they hadn’t heard of Bach, so with lovers of cricket and WG Grace…his name and his career are dates in general knowledge, like 1066 and Magna Charta…grandmothers died in hundreds amongst the lower orders, having presumably held out until the great man had been returned to the pavilion. WG was Atlas holding up in his hand, but as though it were a cricket ball, the world in which all other and later cricketers enjoy their brief day. As noted in the Jubilee Book of Cricket, with his innovations in batting he turned the single-stringed instrument into the many-chorded lyre. He bestrode the game like a colossus – when a Gloucestershire man was given out against Surrey, he rose on the pavilion and boomed to the umpire Shan’t have it; can’t have it; and I won’t have it! Grace was already 47 when he scored 1,000 runs in May, 1895, which was celebrated with a magnum of champagne at Lord’s mid-wicket – as Cardus concludes, He is no legend – he is the game’s presiding spirit..